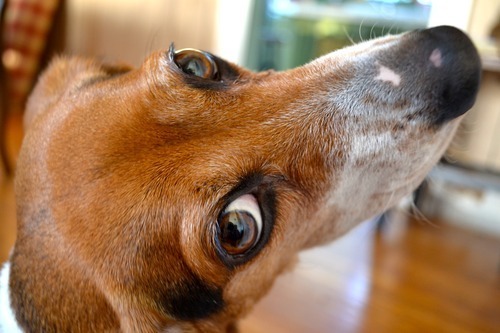 The Little Beagle That Could …. My goal for the rest of the week – month – year? Is to have as much determination and gusto as Molly, my beagle, does. Day after day – night after night – she tries – she hopes- she lives – for that one moment when Nick and I will smile, nod, and let her up on the extra large dog bed called the sofa. And every night for the past 3 years – she is met by a resounding NO. But she tries. God knows she tries. She thinks: What if I just put one paw up? Then maybe they’ll give in? Two paws? Well, gosh, I’m half way there – they’ll have to let me up now. No? I’m not sure what that word means – if I look confused, perplexed, even befuddled – they’ll just pity me for sure. That’s bound to work! No. Molly …. mommy, maybe … daddy, never. But don’t stop trying – never stop trying. Your persistence is amusing and most of all – so inspiring.